Hometown Holidays is the annual Memorial Day street festival in Rockville, Maryland. 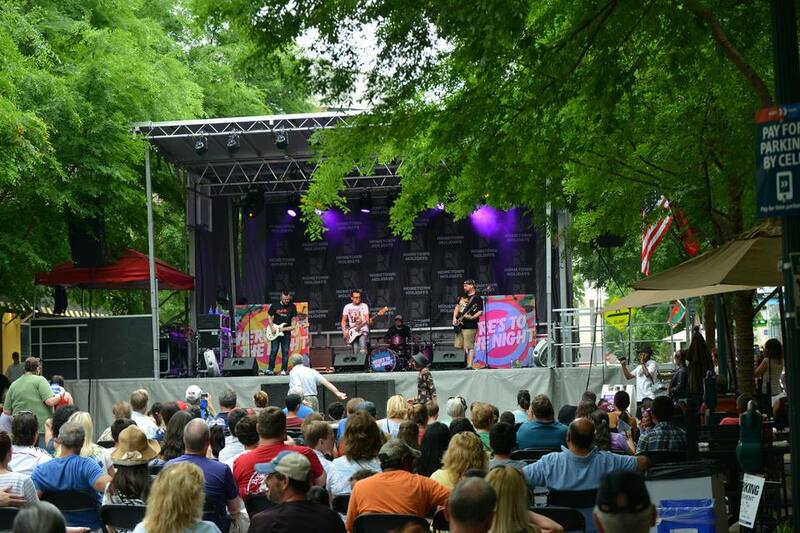 This three-day event, which occurs the Saturday through Monday of Memorial Day weekend, features the Taste of Rockville, dozens of entertainers performing on multiple stages, children's rides, teen activities, a fine arts festival, an environmental expo, ​and the Memorial Day ceremony and parade. The parade—one of the longest-running in the Washington, D.C., area—started in the early 20th century with a regional homecoming picnic and parade on Washington Street, organized by Rockville's African-American community. The Memorial Day ceremony includes music by the Rockville Concert Band and Chorus, a wreath-laying by American Legion Post 86, and a 21-gun salute and presentation of colors by the American Legion Post 86 Color Guard and Rockville City Police Department Honor Guard. The Memorial Day parade includes drill teams, marching bands, floats, community groups, military units, and more. More than 20,000 people typically attend this event. Hometown Holidays is held at the Rockville Town Center and is walking distance from the Rockville Metro Station. Taste of Rockville: Enjoy food and drinks from more than 20 of Rockville's best restaurants. Get your food tickets at a Taste of Rockville ticket booth, then browse the food booths along Maryland Avenue and Courthouse Square. Most menu items cost between one and four tickets each. Musical Performances: More than 30 groups perform across six city blocks in Rockville Town Center for the city's Hometown Holidays Music Fest. Bring your chairs and blankets and get there early to stake out your spot. Kids Entertainment: Free, kid-friendly performances will take place on the Town Square Stage. Memorial Day Ceremony and Parade: On the Monday of the festival, the ceremony takes place at Rockville Town Square in the plaza. Afterward, the parade route begins on Martins Lane, turns south onto North Washington Street, then turns east onto Beall Avenue, south onto Maryland Avenue through Rockville Town Center, and east onto East Montgomery Avenue. Free parking is available at the Council Office Building on Fleet Street, Metro lots, City Hall lots, and the lots north of Beall Avenue. Paid parking is available for a flat fee in the Rockville Town Square Route 355 and North Washington Street garages.